ggplot2, as I’ve already made clear, is one of my favourite packages for R. And since that original post about ggplot2 remains one of my most frequently visited, I thought I would proceed with starting a series of posts called “Make It Pretty”, all about sharing ways of visualizing data that I think are attractive/effective/comprehensive. So with this inaugural MIP post, I will be covering how to plot 2-way interactions using ggplot2. 2-way interactions can come in one of three general forms, and I will be providing code for plotting each. This will be a pretty lengthy post (lots of code/explanation), so if you’re only interested in learning how to plot a particular form, just click the the one below. Oh, and each uses an APA format theme that I’ve shared before, but just click here to quickly flip to the code if you need it. I think it is important for visualizations of data to plot both signal and noise. Often times, I encounter plots–mainly from regression analyses–where all I can see are the trends (e.g., lines of best fit), with no attempts made to visualize uncertainty or error in the those trends. As such, you will notice that with my scatterplots, in particular, I am adamant about plotting the raw data points along linear trends, as I think it is important to recognize that significant associations between variables often still leave much to be explained. This approach may not be for you–I’ve had some colleagues say it’s not a “clean” approach to visualization (especially for continuous x continuous interactions)–but it is how I will proceed, and wanted to at least provide some rationale for this practice. 2-way interactions between categorical variables will most commonly be analyzed using a factorial ANOVA approach. Visualizing 2-way interactions from this kind of design actually takes more coding effort, because you will not be plotting the raw data. Instead, you will need to first summarize the data (means, standard deviations, n per group) via the psychpackage, then calculate a standard error for each group’s mean, and finally, create a bar graph. Start by installing and calling the necessary packages (psych for summary statistics, and ggplot2 for plotting). For all the example figures, I will be using the mtcars dataset, which we will store in a data frame called dat. Next, we are going to use the psych package’s describeBy function, in order to calculate summary statistics for mpg, for each combination of am and vs levels, and we will store these summary statistics in a new data frame called dat2. Have a look at the new data frame, dat2. describeBY will give very generic names (“group1” and “group2”) to your two independent variables. The next few lines of code will give more meaningful names to your variables (Transmission and VS, respectively, because we listed am before vs in the previous line of code), and then we will recode the levels of Transmission to be more descriptive (from 0 and 1 to Automatic and Manual). And finally, the main event: coding the plot itself (into an object called p). We will map levels of Transmission to the x-axis, the mean of MPG to the y-axis, and fill bars with different color depending on levels of VS. We will then add bars to the plot (via geom_bar), spacing them by the dodge parameter we specified earlier. Then add the 95% CIs (via geom_errorbar), also spaced by the same dodge parameter. Finally, take care of some minor formatting by applying our APA theme, relabeling the y-axis, and using a grey-scale color-scheme for the bars, appropriate for publication. If you like how it looks, use the ggsave command to save a high-res .png image file to your home directory. Visualizing an interaction between a categorical variable and a continuous variable is the easiest of the three types of 2-way interactions to code (usually done in regression models). 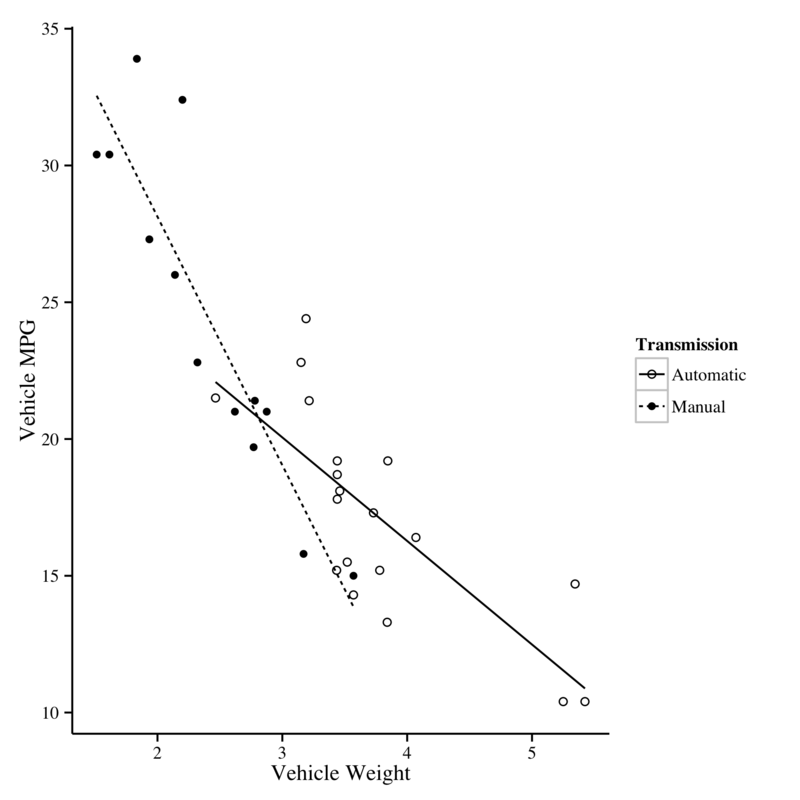 In this example, we will visualize the interaction between the same transmission type variable as before (variable name: am) and the weight of vehicle (variable name: wt) for vehicle fuel efficiency (variable name: mpg). One word of caution: be sure to use the same name and labels when specifying the legend details for the shape and line-type parameters, otherwise it will create two separate legends (in this case: … name=”Transmission”, labels=c(“Automatic”,”Manual”)). Visualizing an interaction between two continuous variables presents a bit of a problem. Specifically, because there is a continuous range of moderator values, it’s not as if there are discrete lines of best–there are no groups here. Instead, there are a number of simple slopes–presumably varying in magnitude and direction–for the entire range of the moderator variable. Often times, only a couple simple slopes are plotted, from one standard deviation above and below the mean of the moderator variable. I am going to keep with this practice, though I am very open to suggestions for how to improve this plot (and either of the others too!). We are going to be looking at the interaction between vehicle weight (variable name: wt) and number of gears (variable name: gear) for predicting vehicle fuel efficiency (variable name: mpg). A quick disclaimer: gear is a variable with only three different values: 3, 4, and 5. As such, it’s pretty tenuous to call it continuous, but I’m just using it for the sake of a plotting example. The first thing we will need to do is run our regression model in order to calculate the simple slopes of wt on mpg at different levels of gear. I like to use Kris Preacher’s simple intercepts/slopes calculator, but do what works for you–but you need BOTH the simple slopes AND (less commonly reported by some programs, like the PROCESS Macro) the simple intercepts. After running the model, I used the vcov command to get the parameter variances and covariances for Kris’s interaction utility. 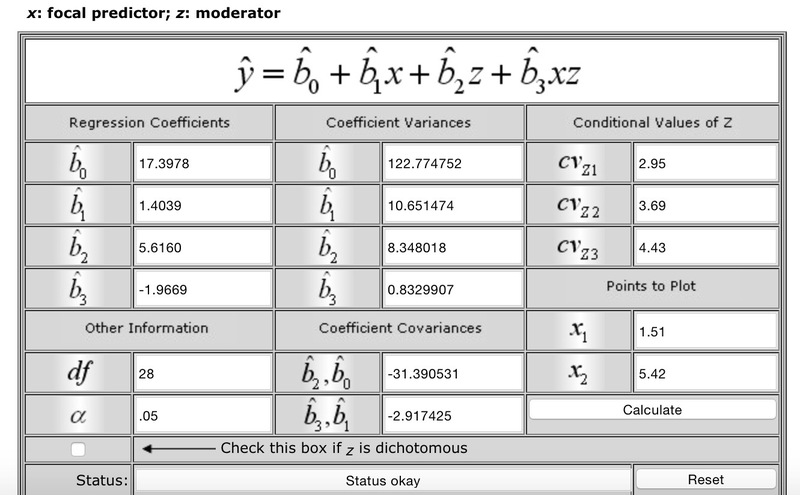 Then, I got the degrees of freedom for the model from the summary of the regression model, and used the psych package’s describe function to get the mean and standard deviation of gear, so that I could plug in the values for 1 SD below the mean, the mean itself, and 1 SD above the mean, as the conditional values of the moderator. I also scooped the min and max of wt as the x-variable points. Info needed for Kris Preacher’s 2-way interaction utility. Click “Calculate”, and scroll down to the “Simple Intercepts and Slopes at Conditional Values of Z” section of output in the first window of the interaction utility–these are the values we will use to plot our simple slope lines. Thanks to a question/suggestion by James Conigrave, I’ve been able to update the code make the plot more pretty. Make a plot called p, and map wt to the x-axis, mpg to the y-axis, and our continuous moderator gear to size–this will produce smaller or bigger points in our scatter plot depending on the value of gear. Give your axes more informative labels using the labs command. We’re going to be creating a legend for different styles of regression lines, and data point size is a pretty intuitive visualization (you can just mention its interpretation in a table note, if necessary), so silence the default size-based legend using “guide = FALSE” in the scale_size_continuous command (otherwise the plot looks cluttered). Now we manually add our simple slopes using the geom_abline command, for which we need to–at the very least in this case–specify intercept and slope values. We will do this three times: first for the simple intercept and slope of wt on mpg at 1 SD below the mean of gear, then at the mean of gear, and then at 1 SD above the mean of gear. In order to specify a different looking line for each (so we can distinguish them), we will enter labels for our lines in the “linetype” sub-command; this simultaneously assigns different linestyles to each simple slope, while controlling how the lines are labeled in the resulting legend. Then, we use scale_linetype_manual in order to specify the particular styles of lines we want for each simple slope, the order we wish for each to appear in our legend, and a name for our legend. Lastly, add our APA format theme, and call the plot. If you’re happy, save the plot. We’ve made some pretty plots, but you might have suggestions for how to improve them. My buddy Matt Baldwin, for example, likes to put a vertical line(s) (based on the Johnson-Neyman technique; see Preacher, Curran, & Bauer, 2006, for a nice writeup) showing at what value(s) for a moderator that simple slopes diverge (see below). This can be easily done by using the geom_vline() command, and entering in the particular J-N value for the xintercept value (e.g., geom_vline(xintercept=4.45)). 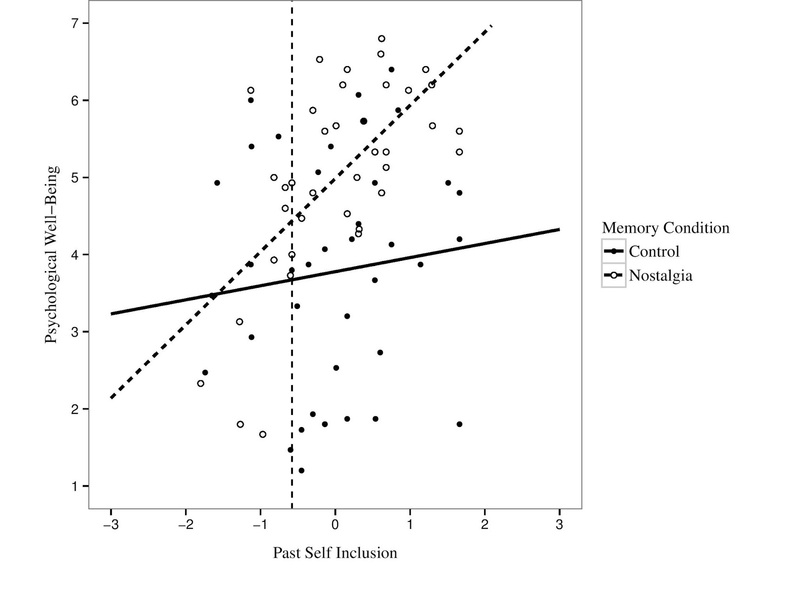 From Baldwin & Biernat (2015); the simple slopes for the nostalgia condition and control condition significantly diverge beyond a certain level of past self inclusion (indicated by dashed line). I’m sure there are a number of other ways to improve these plots. Feel free to post suggestions and/or code in the comments; I’ll amend the code in the core of the post based on really good suggestions, or for others, might provide example code and plots down here in the extras. And if you have any requests for a Make It Pretty post, let me know–I’m thinking I might do forest plots next. *Full disclosure: I have no idea what V/S refers to. I’m pretty car-stupid, and the online documentation for the mtcars dataset isn’t helpful for this particular variable. I simply selected it for the sake of example, as it produces a significant interaction with transmission type. These are beautiful thank you for this post, I’ve been battling to add a legend for the three lines to your latter interaction plot. Thank you–glad you like it! I ended up finding a solution with the help of this post on StacksOverflow (http://stackoverflow.com/questions/18060116/adding-legend-to-ggplot-when-lines-were-added-manually). Amended code is below (and Ill make the default in the post later, because it’s much prettier than the original (so thank you for indirectly improving the plot)! Hi, I am really thankful for such a nice explanation about interaction mode. Could you please do a favor by describing the statistical significant effect of each graph you created? More precise, how can I understand, looking at the figure, whether the result is statistically significant particularly for the one continuous and one categorical interaction? Many thanks again! Unfortunately, there is no simple, foolproof way to eye-ball the figure to determine what, if anything, is significant. To get this kind of information, you first need to test the interaction term (in regression) to see if it is significant, and then, if so, follow up by testing the simple-slopes for significance. In the present example, this amounts to evaluating whether the slope of weight is significant among automatic cars, and then separately, whether the slope of weight is significant among manual cars. You can do this using some available simple-slope calculators (such as the one, here, supplied by Kris Preacher: http://quantpsy.org/interact/index.htm), or you can use a re-centering method. With the re-centering method, you simply conduct the same regression model two different ways, changing the way the categorical variable is dummy coded each time. For example, if you coded automatic as 0 and manual as 1, the slope of weight in the full model would represent the simple slope of weight for automatic cars; changing the dummy coding so that automatic is 1 and manual is 0 and running the same model again, will result in the slope of weight representing the simple slope of weight for manual cars. Hope that helps! If you need a more thorough walkthrough of testing simple slopes, I recommend checking out Andrew Hayes’s newish book on testing mediation, moderation, and conditional process models in regression. Hi jksakaluk! Very much appreciated for the explanation. Thanks again! 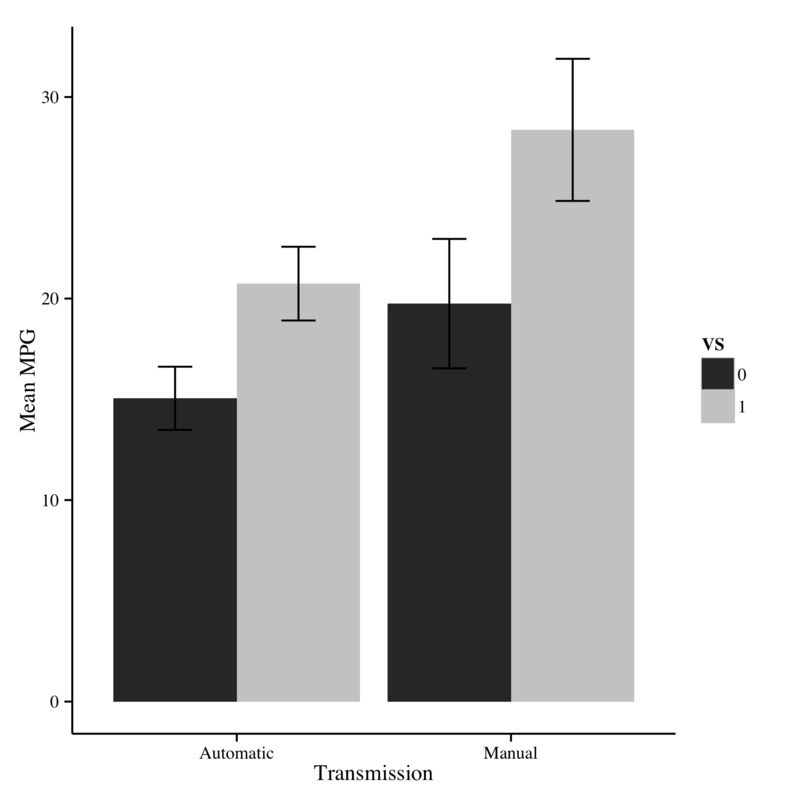 Hi, I was wondering if you could do an example for a three-way interaction plot, e.g. continuous x continuous x categorical interaction. Thanks! Thanks for the quick reply and your suggestions! I am in psychology too, though specifically psycholinguistics. I’ll try out your suggestion. 🙂 Hope your move goes smoothly!